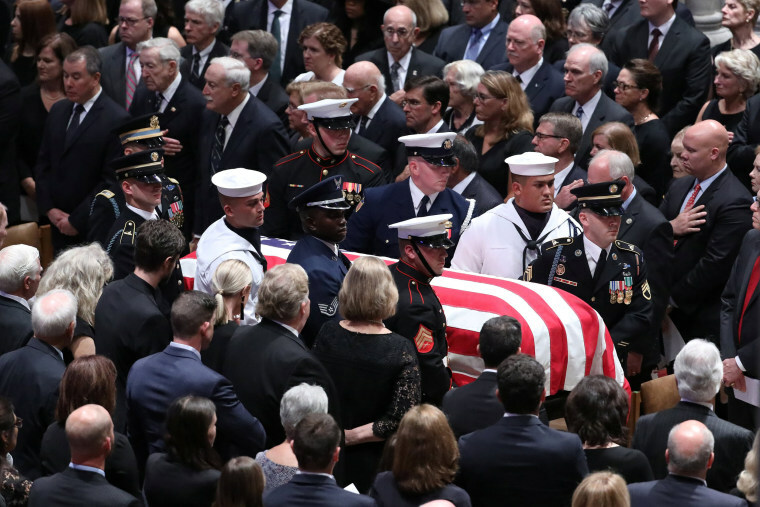 After a five-day procession that served as a last goodbye for the nation, John McCain's eight-decade journey as a servant of his country came to its final resting place on Sunday as he was buried at the U.S. Naval Academy cemetery in Annapolis, Maryland. 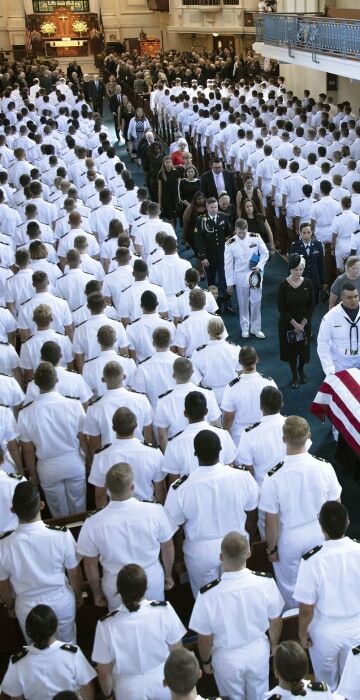 Members of the military carry the flag-draped casket of the late U.S. Senator John McCain, Republican of Arizona, after arriving on a military airplane at Joint Base Andrews in Maryland on Aug. 30, 2018. 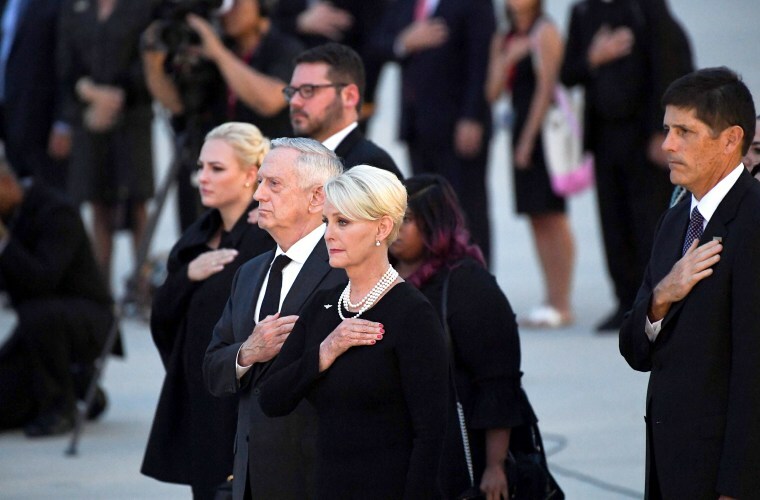 Cindy McCain, her daughter Meghan and U.S. Secretary of Defense James Mattis watch as his flag-draped casket arrives on Aug. 30. 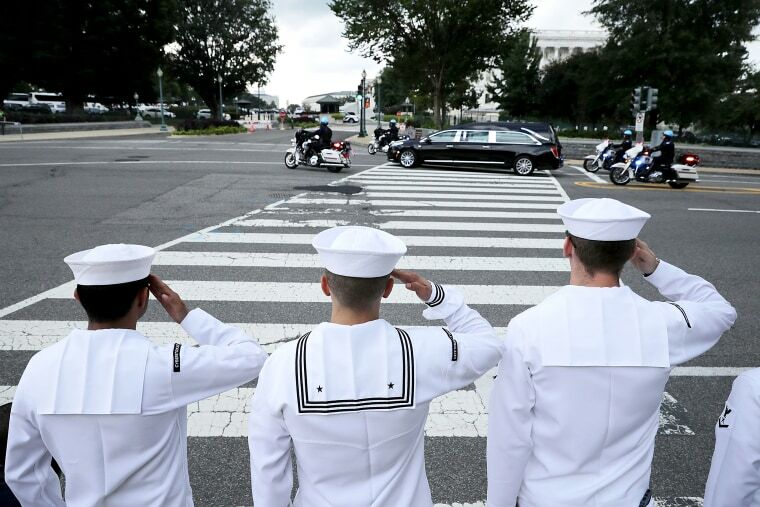 U.S. Navy sailors Petty Officer Kevin Aldana, Seaman Colin Dupon and Petty Officer Kyle Reed salute as McCain's funeral procession passes on it's way to the U.S. Capitol on Aug. 31 in Washington. 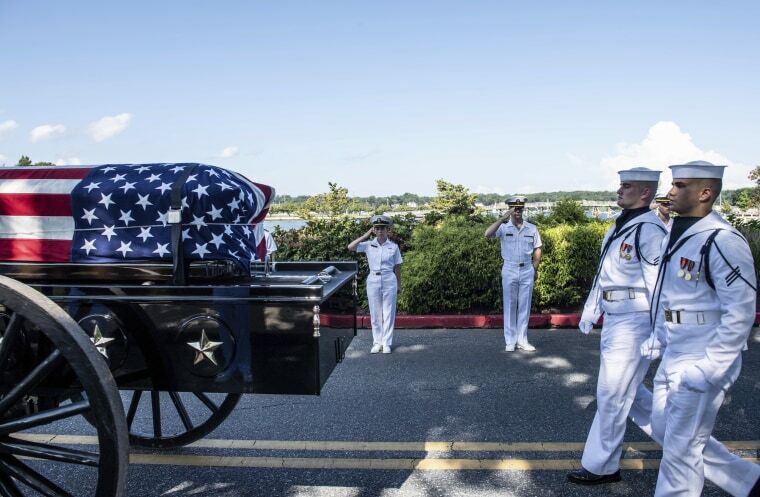 Based at Fort Mead, Maryland, the sailors decided to use one of their days off to come to Washington and pay respect to McCain. 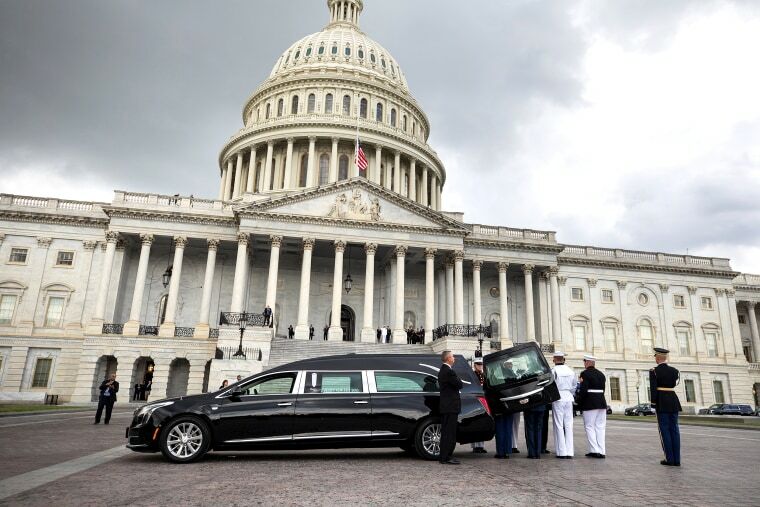 Joint service members of a military casket team prepare to carry McCain's casket into the U.S. Capitol, where he will lie in state for the rest of the day on Aug. 31. Cindy and her son John Sidney await the arrival of McCain's casket on Aug. 31. 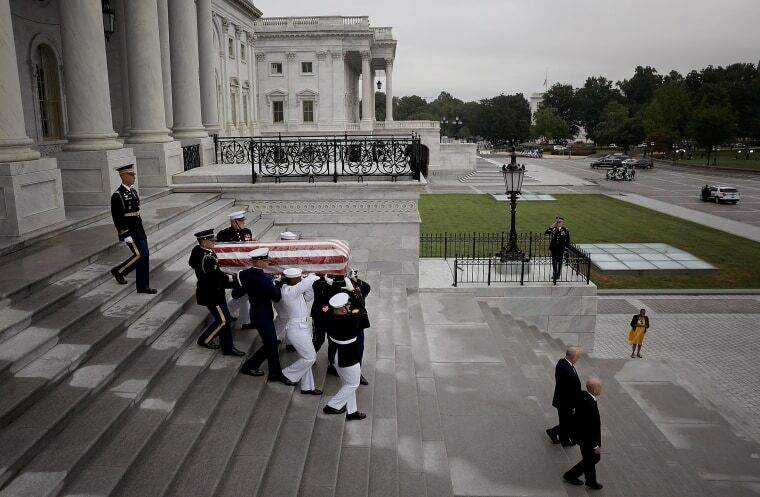 Joint service members of a military casket team carry McCain's casket into the U.S. Capitol on Aug. 31. 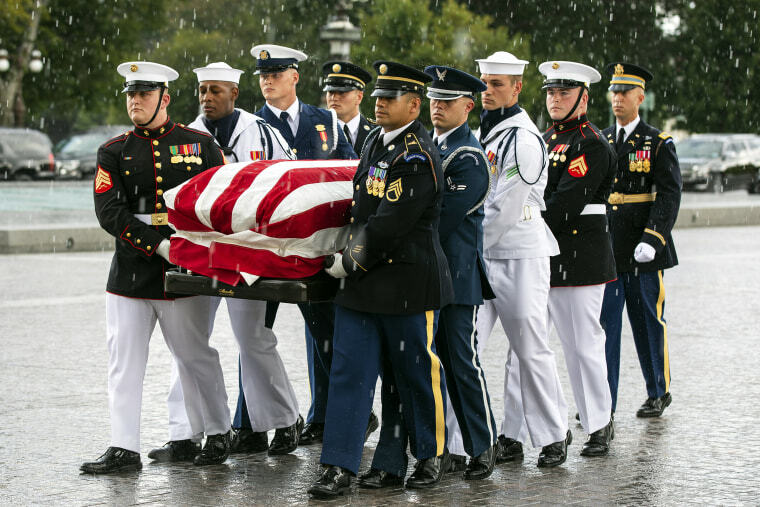 McCain's casket is carried up the steps of the U.S. Capitol as rain starts to pour down on Aug 31. 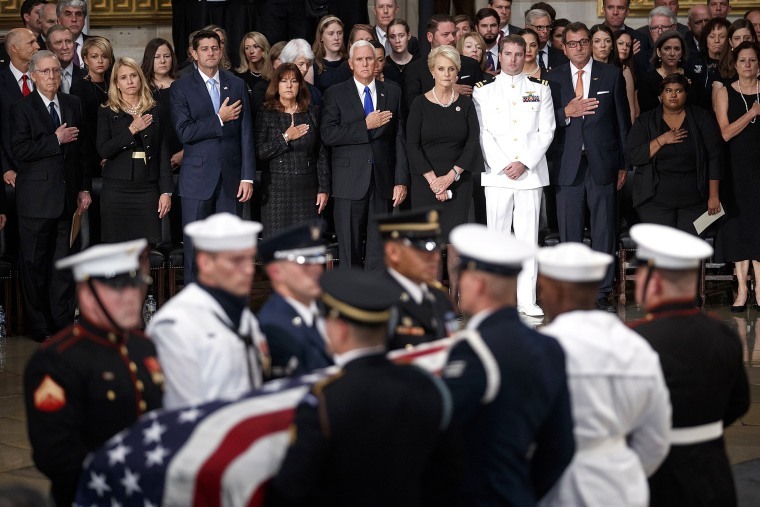 Cindy McCain with members of the McCain family, Vice President Mike Pence, Karen Pence, Speaker of the House Paul Ryan and Senate Majority Leader Mitch McConnell watch as joint service members of a military casket team carry McCain's casket into the Rotunda on Aug. 31. 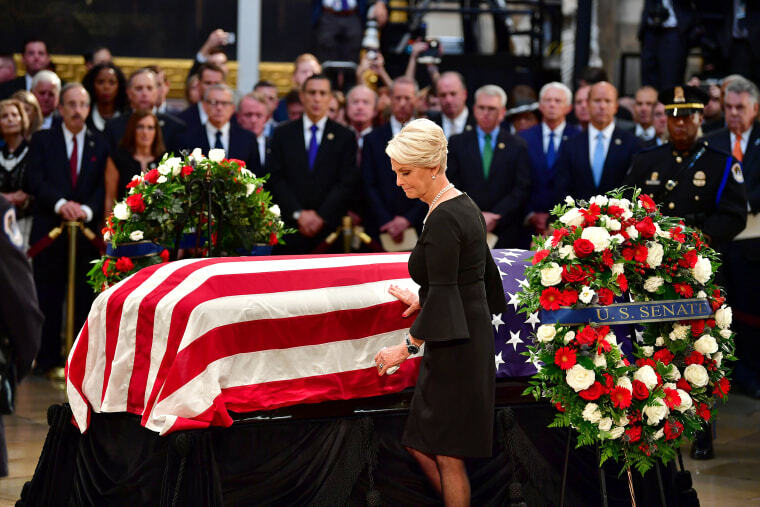 Cindy McCain pays her respects to McCain's flag-draped casket on Aug. 31. 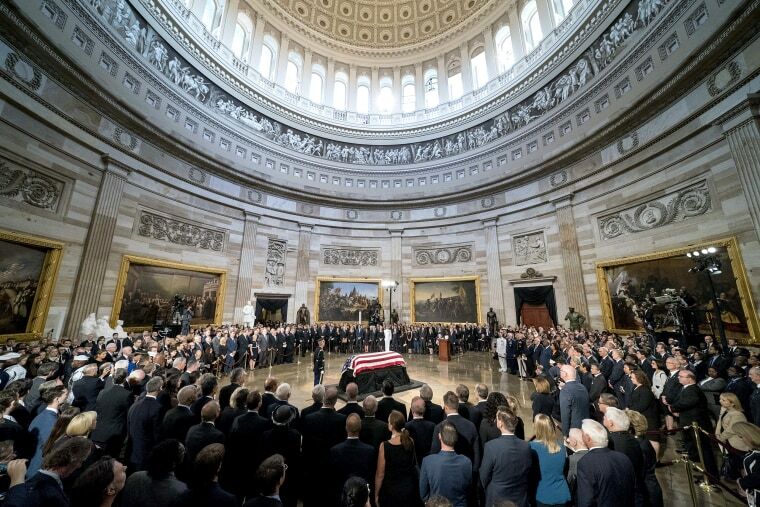 McCain's casket lies in state at the U.S. Capitol, on Aug. 31. 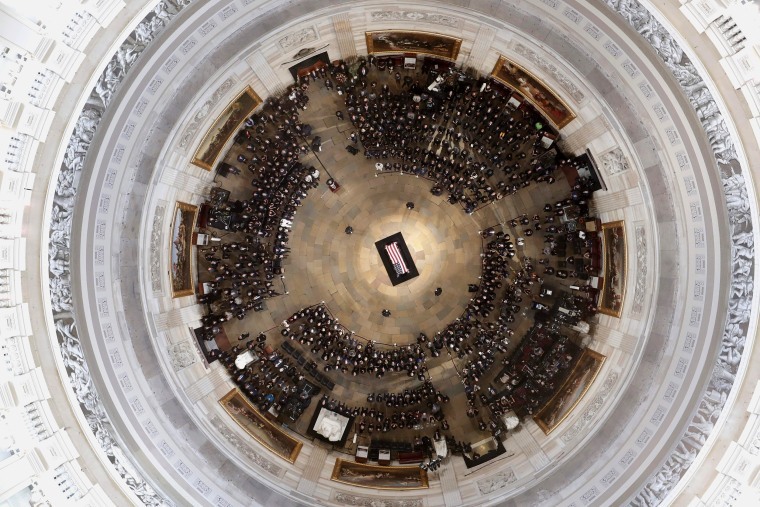 McCain is only the 31st person to ever receive the incredible honor of laying in state at the U.S. Capitol Rotunda. Mitch McConnell and Chuck Schumer stand at McCain's casket to pay their respects on Aug. 31, 2018. 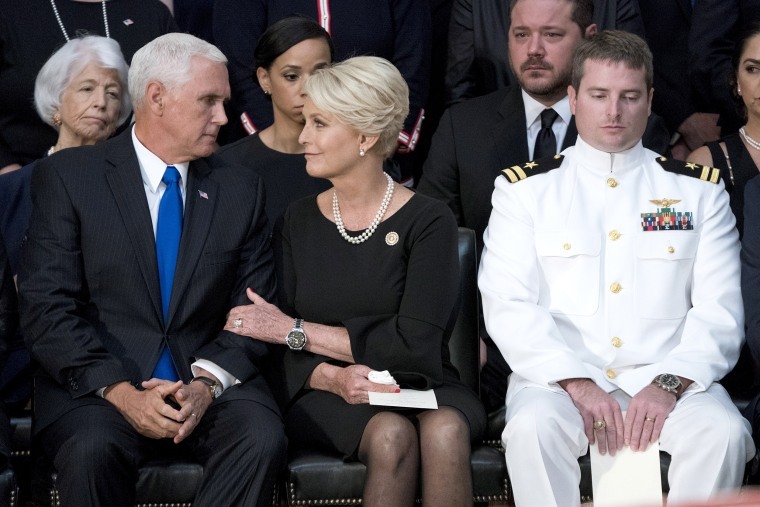 Cindy McCain talks with Pence while her son Jack looks on in the Rotunda on Aug. 31. 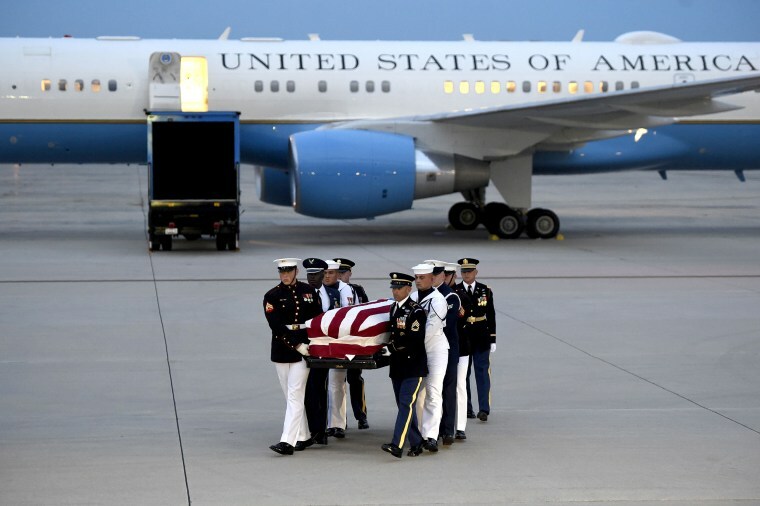 McCain's casket lies in state on Aug. 31. 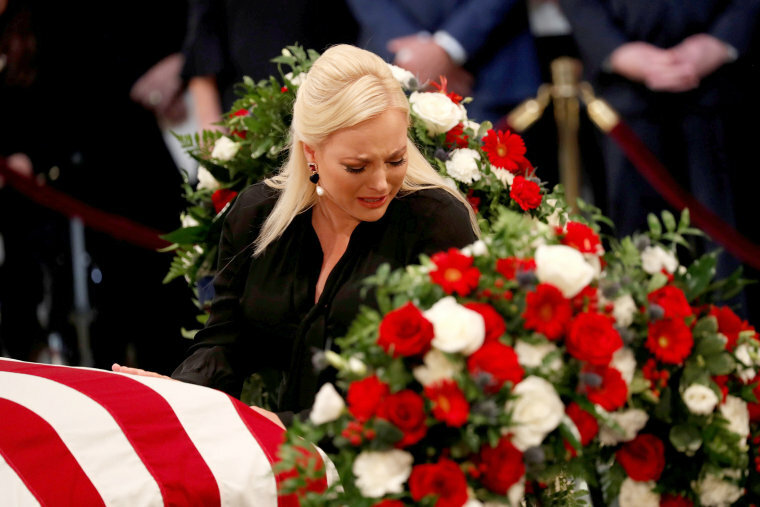 Meghan touches her father's casket during the ceremony on Aug. 31. 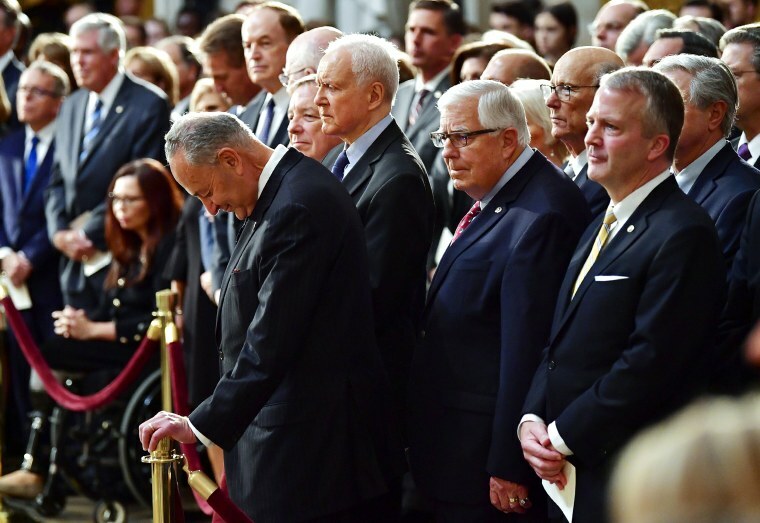 Schumer bows his head with other mourners who surround McCain's casket on Aug. 31. 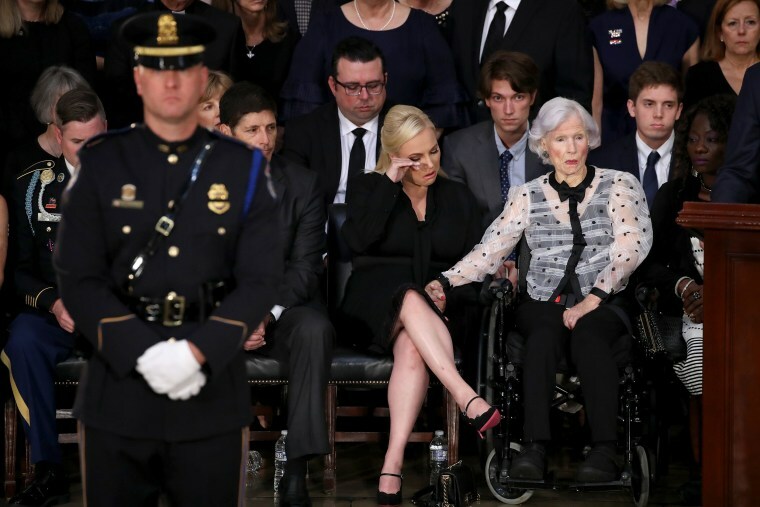 Roberta McCain, the mother of John McCain, age 106, and Meghan listen to speeches during the ceremony on Aug. 31. 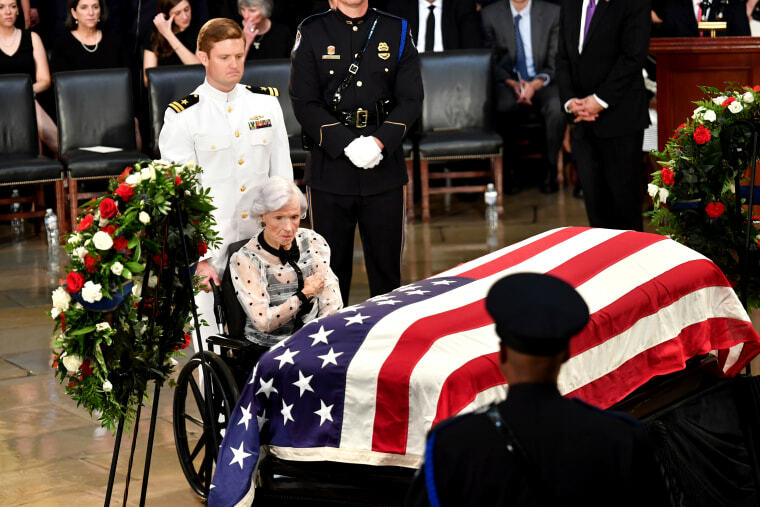 Roberta McCain approaches the casket during the ceremony on Aug. 31. U.S. Senator Joe Liebermen and his wife, Hadassah Lieberman, pay their respects during the ceremony on Aug. 31. 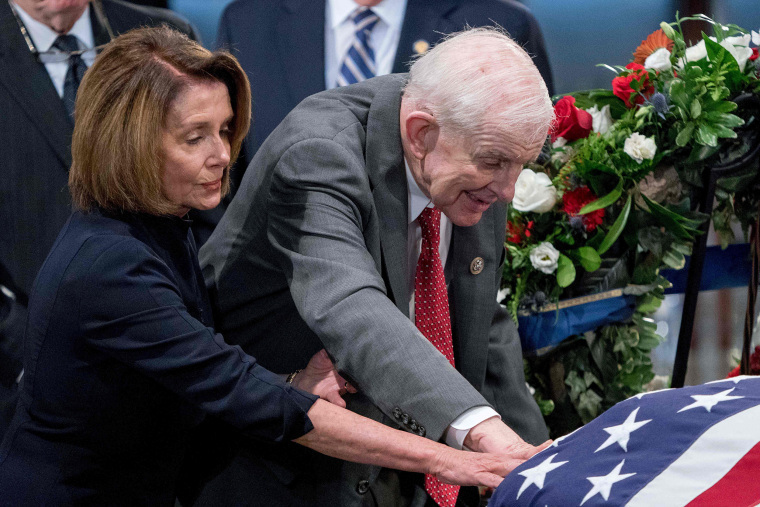 House Minority Leader Nancy Pelosi and Rep. Sam Johnson touch McCain's casket as they pay their respects on Aug. 31. 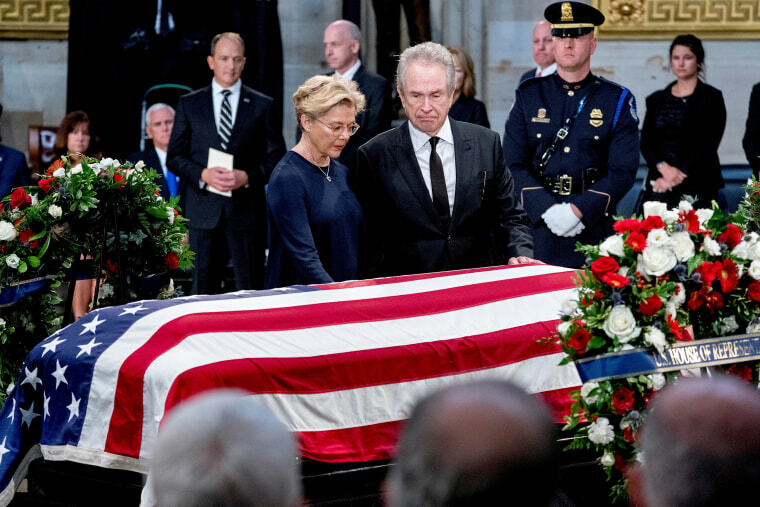 Actors Warren Beatty and his wife Annette Bening stand over McCain's casket on Aug. 31. 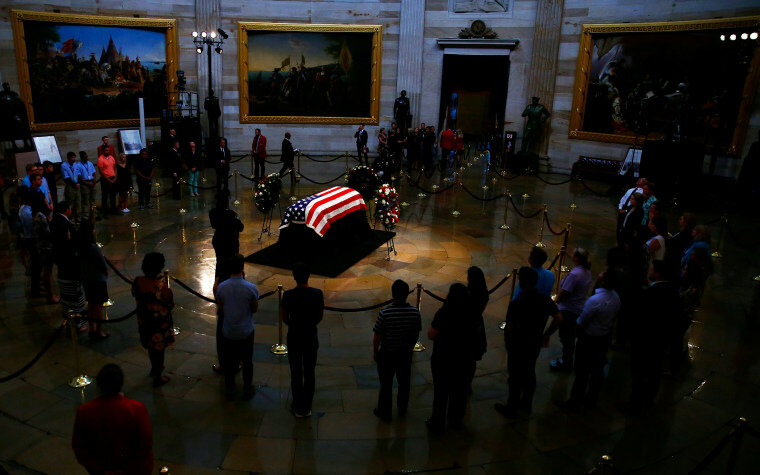 Mourners look at McCain's casket as it lies in state inside the U.S. Capitol Rotunda on Aug. 31. 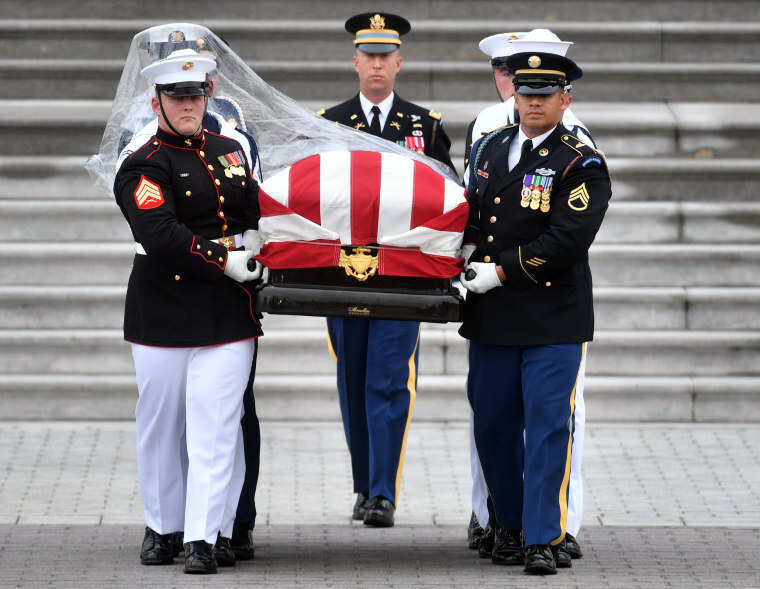 A military honor guard carries McCain's casket from the U.S. Capitol Sept. 1, 2018. 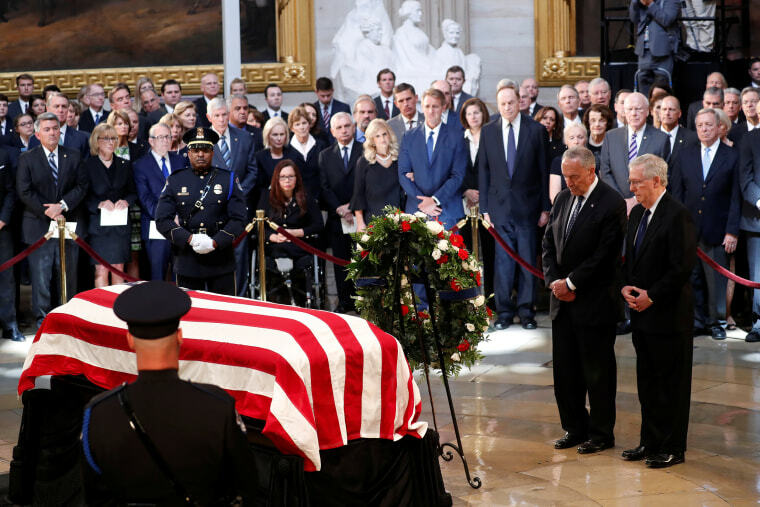 Politicians on both sides of the aisle, including former adversaries, paid tribute to McCain at his memorial service in Washington later that morning. 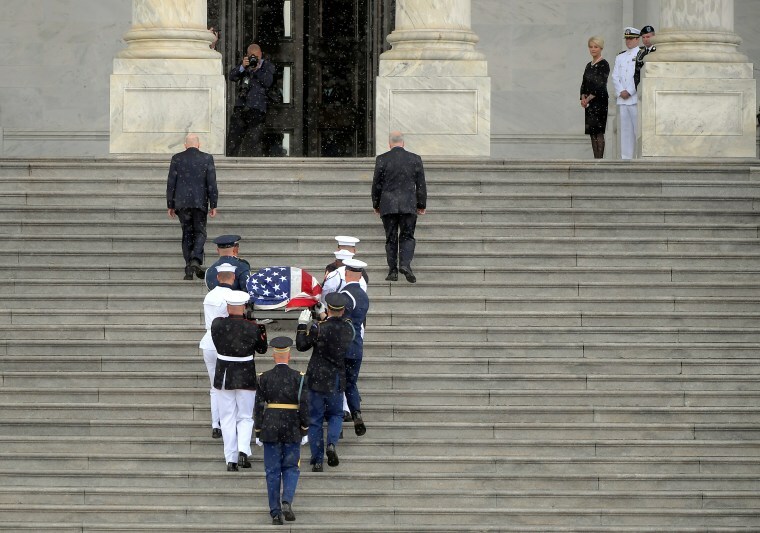 McCain's casket is carried down the steps of the U.S. Capitol ahead of his memorial service at the Washington National Cathedral on Sept. 1. 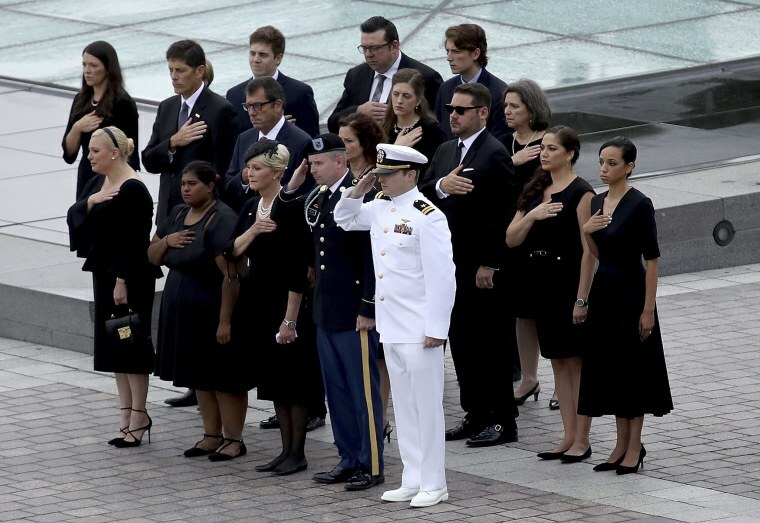 Members of the McCain family watch as a military honor guard carries McCain's casket from the U.S. Capitol on Sept. 1. 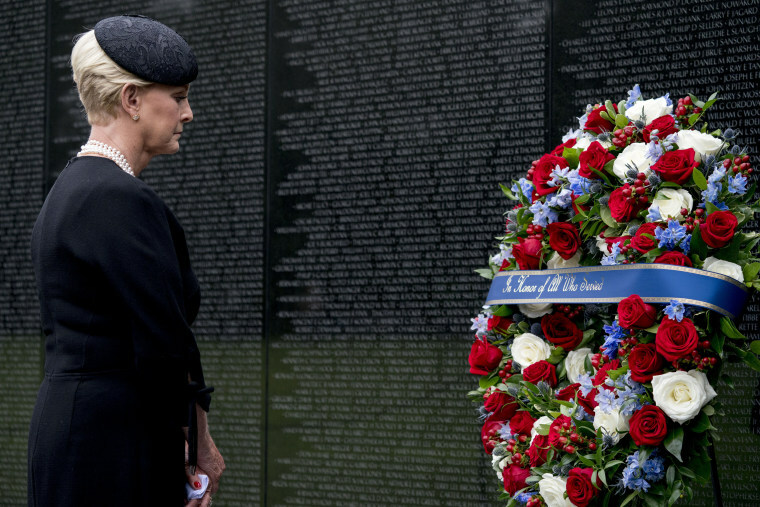 Cindy McCain lays a wreath at the Vietnam Veterans Memorial during a funeral procession for her husband, John McCain, on Sept. 1. 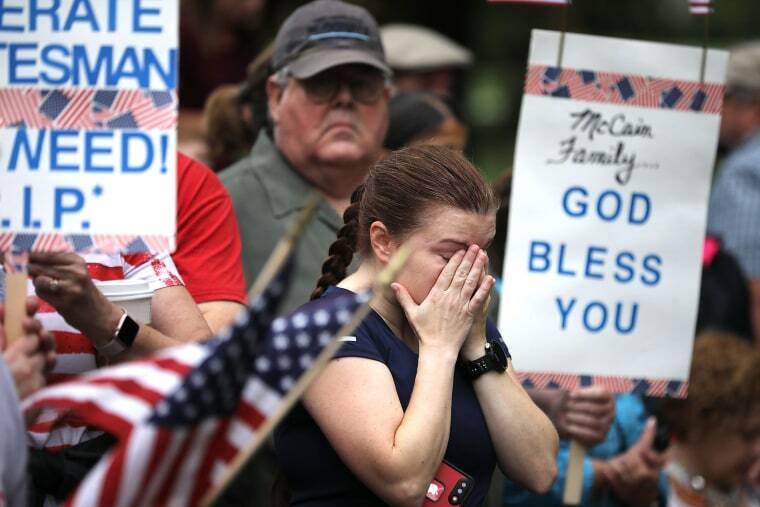 A woman wipes away tears following a wreath laying ceremony to honor McCain at the Vietnam Veterans Memorial on the National Mall on Sept. 1. 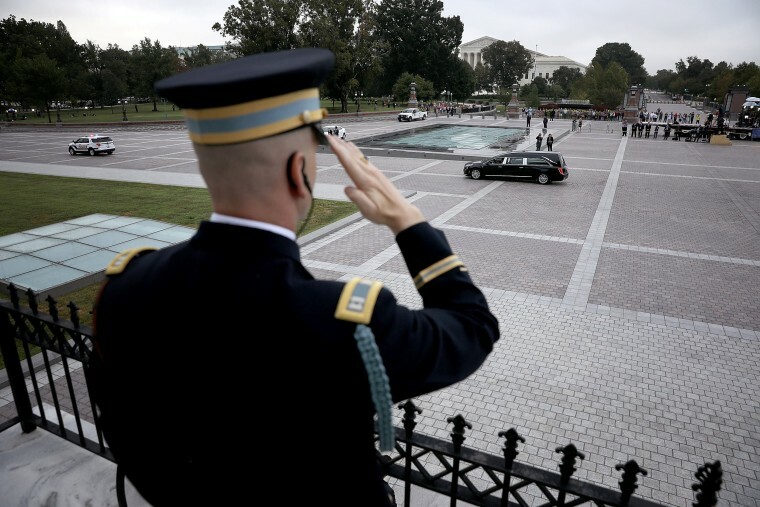 A member of a military honor guard salutes the hearse carrying McCain's casket on Sept. 1. 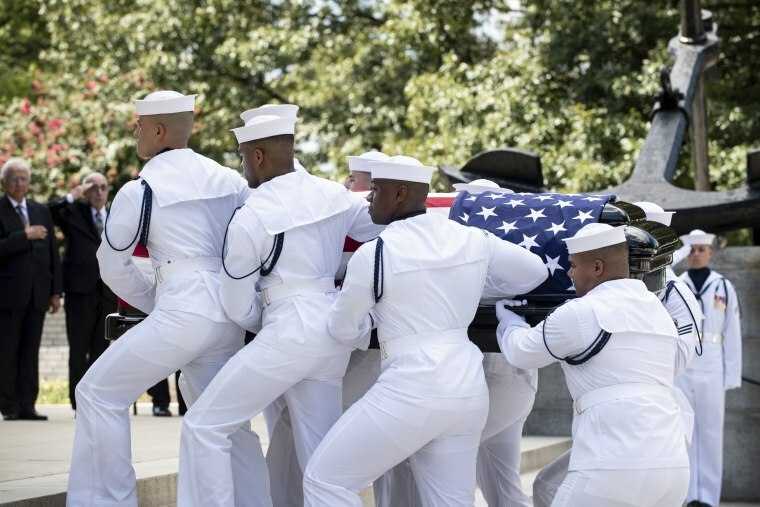 A joint service military casket team prepares to unload McCain's casket at the Washington National Cathedral on Sept. 1. McCain's casket arrives for his memorial service at the National Cathedral on Sept. 1. 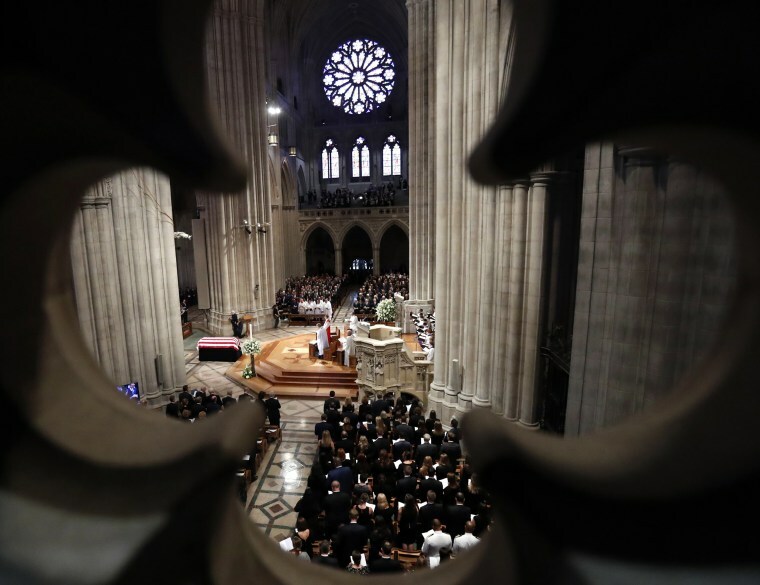 Dignitaries and invited guests attend a memorial service for McCain at Washington National Cathedral on Sept. 1. 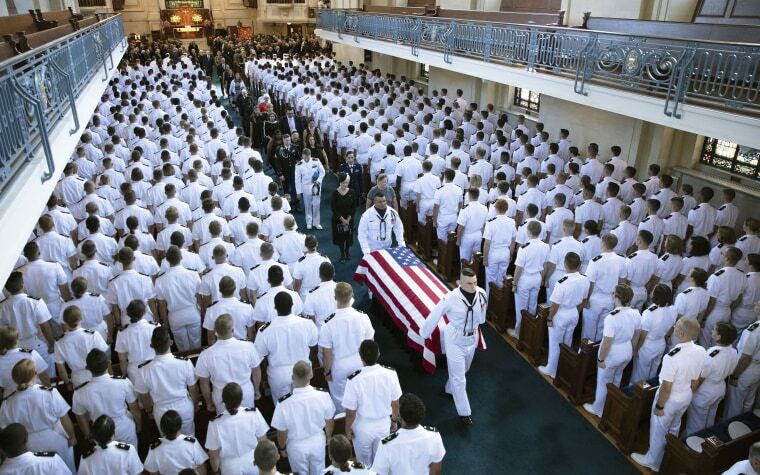 Navy Body Bearers carry McCain's casket into the United States Naval Academy Chapel in Annapolis, Maryland, on Sept. 2. 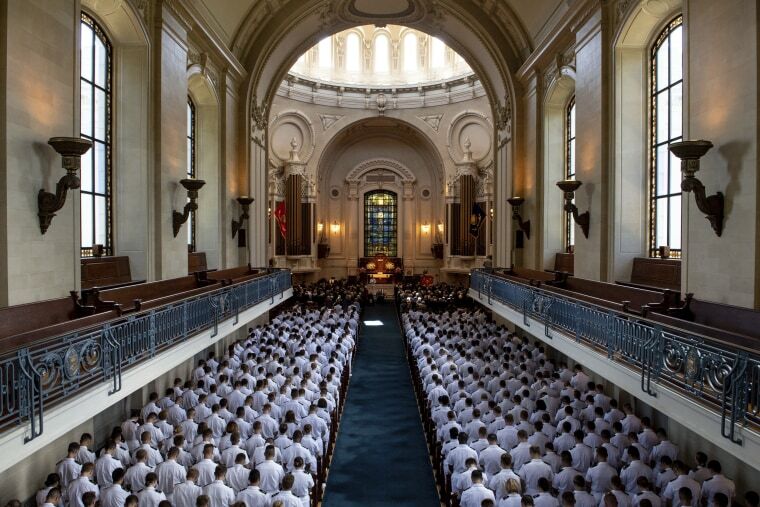 Senator's McCain funeral service inside the United States Naval Academy Chapel on Sept. 2. Family members follow McCain's casket as it is moved from the chapel following the service on Sept. 2. Navy Body Bearers move the casket to a horse-drawn caisson after McCain's funeral service on Sept. 2. 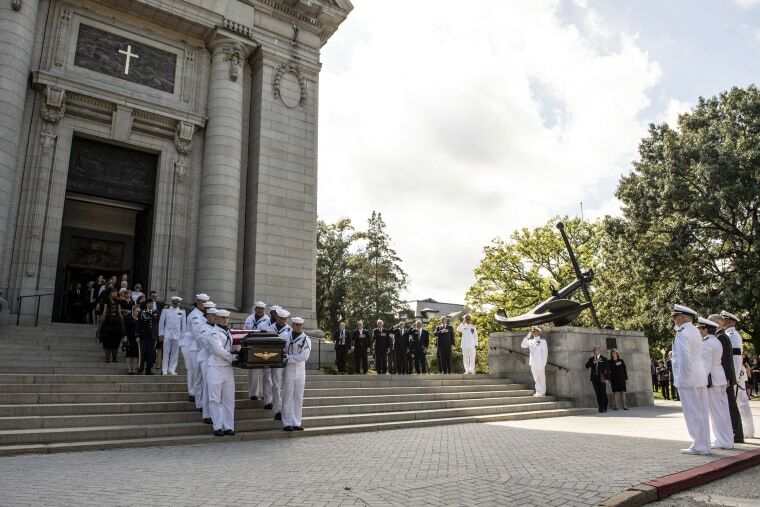 Midshipmen salute as a horse-drawn caisson transports the flag-draped casket to the United States Naval Academy Cemetery for the burial service on Sept. 2. 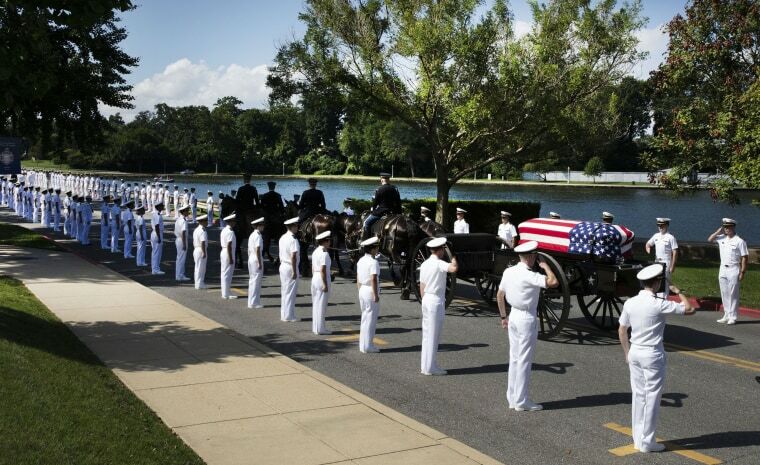 The horse-drawn caisson moves through the grounds of the United States Naval Academy toward the cemetery on Sept. 2. 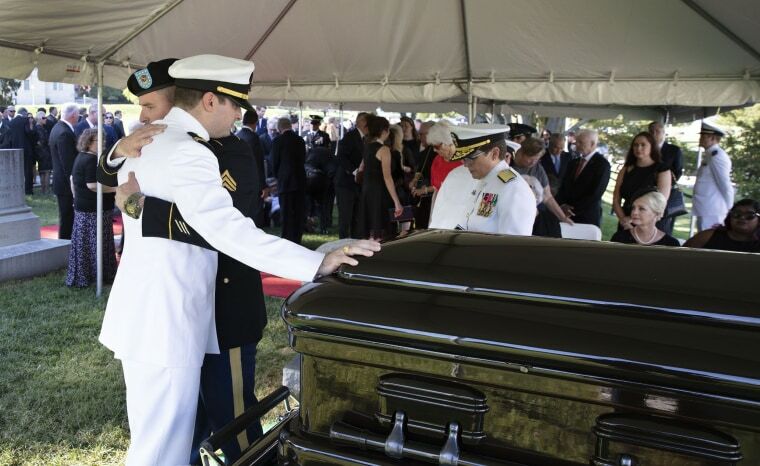 Jimmy McCain, right, hugs his brother Jack during their father's burial service at the United States Naval Academy cemetery in Annapolis, Maryland on Sept. 2. 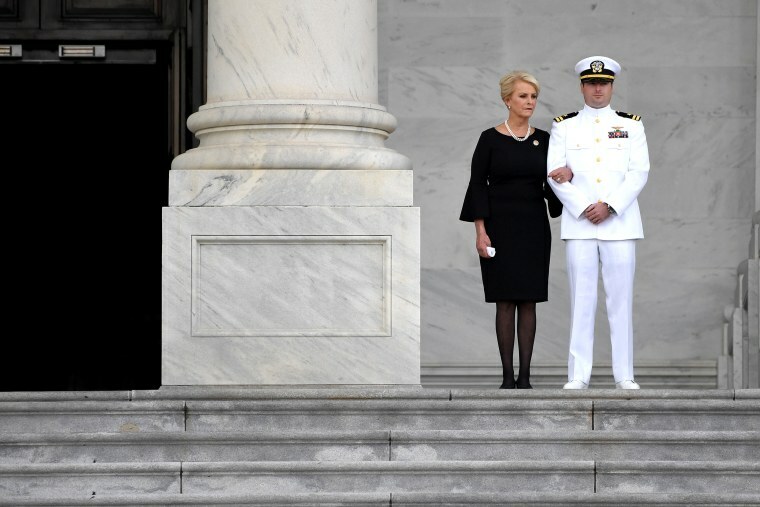 Cindy McCain lays her head on her husband's casket during a burial service United States Naval Academy cemetery in Annapolis, Maryland, on Sept. 2.